Continuum soaks up the rays in Sioux Falls, South Dakota. 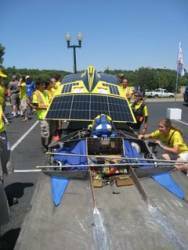 A sleek-looking solar car built by a University of Michigan team was first across the finish line early in the afternoon of July 22 after a long, hot 10-day 2,400-mile (4,000 km) race from Plano, Texas to Calgary, Alberta. And once again GPS and satellite-based differential corrections play a key role. This year, 15 solar-powered cars built by students from universities in the U.S., Canada, and Germany completed the 2008 North American Solar challenge. Michigan has won five out of nine NASC races, held every other year since 1990. On sunny days with clear skies, the 2,500 aerospace-grade gallium arsenide solar cells on the winning car, Continuum, produce about as much power as a hair dryer. Continuum averaged 46 mph and was in the lead from the outset of the race. The Michigan team’s blog emphasized the importance of accurate GPS and route information to their success. They used Topcon GPS equipment and OmniSTAR’s commercial differential GPS service to gather sub-meter accurate data for the route. “This helped us plan ahead and save extra energy in the battery for those nasty hills,” they said. The technical underpinnings of Michigan’s winning Continuum car is the subject of the September-October 2008 cover article in Inside GNSS magazine. Toyota and Chowder College Missouri Alternative and Renewable Energy Technology (MARET) Center sponsored the 2008 race. Previously, the NASC — first called SunRayce USA — was sponsored by the US Department of Energy. However, funding was cut near the end of 2005, and the 2007 race was cancelled.